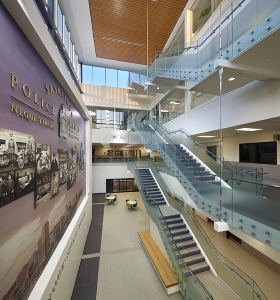 The new Saskatoon Police Service headquarters project proposal was officially approved by Saskatoon City Council on Monday, June 13, 2011. A ground-breaking ceremony was held at the new headquarters site north of 25th Street East near Ontario Avenue on June 24th, 2011. Construction was completed in June of 2014 and a grand opening ceremony was held on July 16, 2014. In March 2016, the building was awarded "Silver" status in Leadership in Energy and Environment Design (LEED) certification. Total project budget revised to $122,100,000. Includes: building, land, parking structure, equipment, and consulting fees. Original cost estimates were based on four year old figures. Since then the City's growth projections have increased and more extensive plans for parking were needed driving up the cost estimate. The new building requires secure parking for more than 200 police vehicles and provisions for staff parking with a projection of 800 spaces within 10-15 years. Staff are required to pay for parking. The new, centralized Headquarters will accommodate the police service for up to 50 years. Once the civic population increases to between 300,000 and 325,000 the service would require sub-stations, however a core, central facility is still needed to house exhibits, forensic examination, a police range, etc. The new Headquarters will not be extravagant. It will be a functional building designed for use 24 hours a day, seven days a week. The Service has put off upgrades to the 911 Call Centre and the purchase of computers and servers until it moves into the new facility. Every viable piece of equipment will be moved from the old building to save costs. 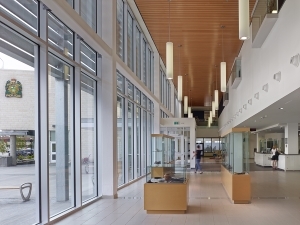 Comparisons have been made to recent decisions in Calgary and Winnipeg to renovate existing buildings for their Police Services, however both those cities have remand centres and police are not required to house detention units as they are in Saskatoon. The old police headquarters building was constructed in 1977, built for a total staff of 300. There were 650 staff working out of nine locations. Parking was in eight locations and the Service was paying $1,000,000 a year to lease the other locations needed to function. Three different Police Chiefs have worked on this issue. Since 2002 the cost of the new facility has risen from $42,000,000.